Last night I attended a screening of Timor-Leste’s first feature film, A Guerra Da Beatriz (Beatriz’s War). 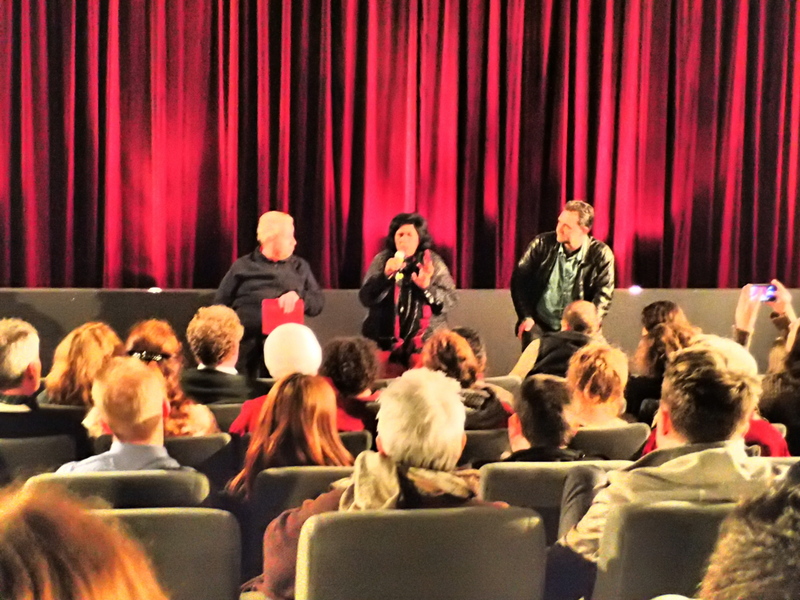 The screening was followed by a question-and-answer session with the film’s co-director Luigi Acquisto, and co-producer Lurdes Pires. It’s a very moving film. It presents a retelling of the old French tale of Martin Guerre, set against a backdrop of Timor-Leste’s recent history of conflict, with the invasion of East Timor by the Indonesians, the brutality of life lived under occupation, and of the early months of independence. In this tale, a man disappears during a war, returning many years later to his wife. All the others in their village believe he is who he says he is; his wife Beatriz realises that he is an imposter, but falls in love with this new man nonetheless. (I hope that’s not a spoiler; it’s a pretty well-known story). This was how a friend shared a recent Kickstarter campaign on social media. 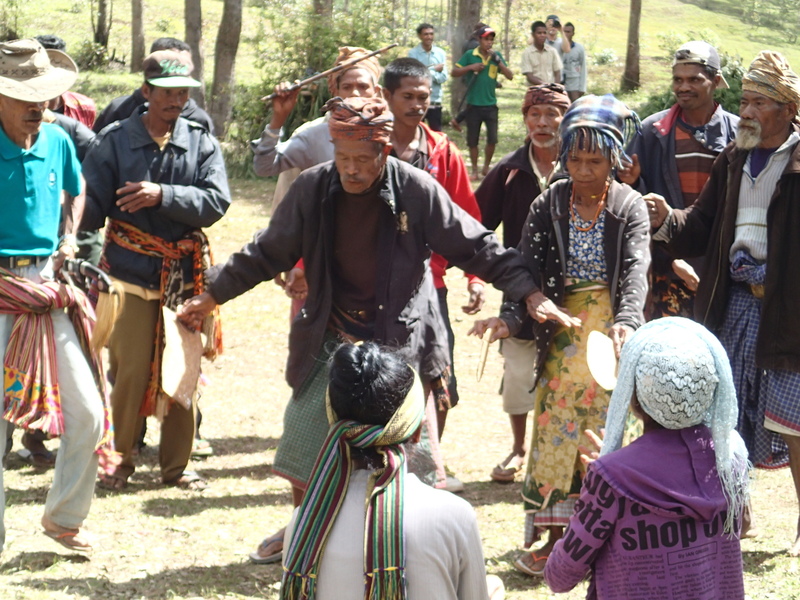 The campaign was in support of an enactment of a traditional music-theatre ceremony in Timor-Leste that hadn’t been performed in over a decade. The knowledge about this ceremony – how to perform it, the musical material and how it is structured, the rules and protocols surrounding its performance – was in danger of being lost. The two elders (cultural custodians) who knew it in detail were ageing – if a performance didn’t take place soon it was possible that they could pass away without their knowledge having been passed on to a younger generation. The ceremony isn’t performed very often because it is really big and requires a huge amount of preparation and logistical planning. It can involve 80-100 performers, who need to travel and stay overnight (possibly for multiple days in a row) and set aside their other day-to-day work and responsibilities in order to take part. The event is called Maulelo, and while I was Timor-Leste I was able to travel to the site and observe the final day of rehearsals. The setting was halfway up a mountain, near the small town of Hatubuiliko, and in the foothills of Mount Ramelau, Timor-Leste’s highest mountain and a sacred site of pilgrimage and Timorese national identity. To get there, we walked for a while out of Hatubuiliko town, and then at a critical point we left the path and scrambled our way up a steep, narrow, twisting goat track. This took us above the clouds that had descended upon the town to a clearing on a narrow saddle, ringed by pin-straight, narrow eucalypts, reaching toward the sky. A few weeks back I wrote a post on reciprocity in research. In that post, I shared my resolve to find ways to engage my research participants in Timor-Leste in an exchange of knowledge and information of mutual value. I discussed with different organisations the possibility of leading training workshops for their staff, in order to ‘give something back’ to people, so that taking part in research was beneficial to them, as well as to me. I did lead these workshops, and they seemed to be appreciated and valued. However, I also observed there were other ways that I could make a tangible contribution to people’s work and lives, simply through having conversations and sharing observations. Two conversations stood out for me as being of particular value to the participants. 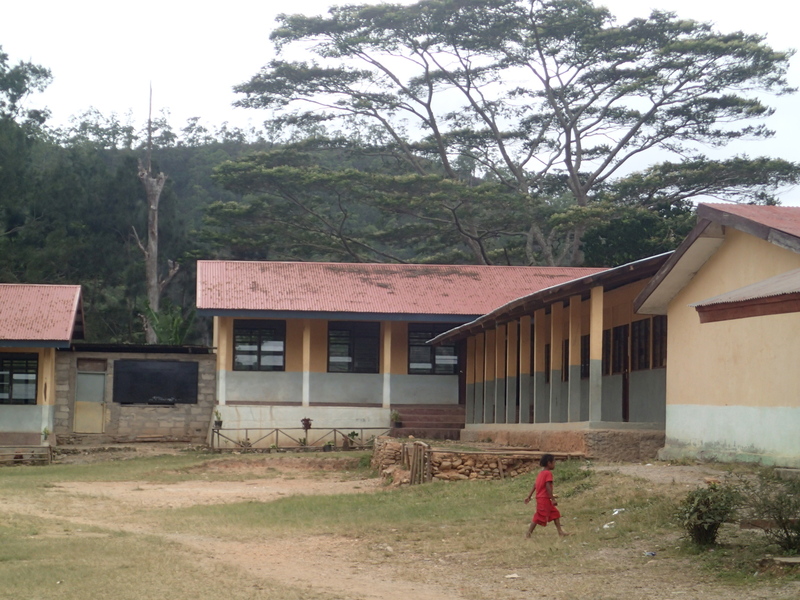 The first conversation was at a remote rural school. In 2009, this school had been chosen by a local Catholic organisation to participate in a pilot music education project. Everyday for a week, all the students in the school had music classes, playing percussion instruments, and learning to read rhythms and perform in a piece. At the end of the week the older classes were invited to perform at a concert in Dili, at the Presidential Palace. This story made me feel sad too. 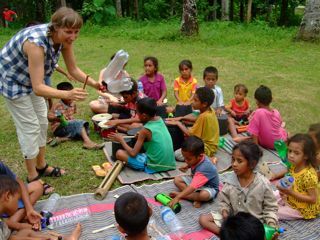 I knew that the instruments used in that pilot project were high-quality classroom percussion instruments, available to buy (if you have money) in Australia, but certainly not available in Timor-Leste. I also felt disappointed that, if the instruments were to be taken away, efforts hadn’t been made to ensure the training the teachers had taken part in modeled some locally-available musical instrument alternatives. (I acknowledge that there are many reasons why this may have been complicated to do at the time, particularly with traditional instruments in Timor-Leste and the rules that surround their usage; but I still feel disappointed to hear the teachers’ stories of essentially having their excitement and interest built up, only to lose what they understood to be the essential tools for the continuation of the project). The teachers told me they had time to stick around a little longer, so I talked to them, via my interpreter, about the experiments with instrument-making that my partner Tony and I had done in Lospalos, back in 2010-2011. I told them how we’d discovered that our next-door neighbour had instrument-making skills, making for us a simple bamboo log drum called a kakalo. Kakalos were ‘work instruments’ – noise-makers traditionally played by children charged with guarding crops against foraging animals. I told them how, when he made the first kakalo for us, his own children seemed to look on in absolute fascination. It seemed to me that they didn’t know their father had these skills and knowledge. It was as new to them as it was to us. Perhaps, I said, there are people in their own community who have similar instrument-making knowledge. They may not know about them. We found out about our neighbour’s skills because we were already experimenting with bamboo, and he was jolted into action after observing our (somewhat feeble, albeit well-meaning) efforts. I played them a video I’d made that showed us making the kakalos, and the local children playing them. The teachers were fascinated by this story, so next I showed them video of some of our other instrument-making efforts – making shakers by putting stones into empty plastic bottles, or making agogo-bells from empty plastic bottles pumped hard with air so that they gave a bell-like tone when struck with a stick. I also told them that, at the time of the music education pilot program, other music projects by this organisation had also stopped. I felt that I was picking up a sadness that they had been left behind because they are far from the capital city, that they had missed out because they are remote. I felt that it was important that they knew it wasn’t just them. This didn’t make their situation any better, but perhaps it would help them to feel less isolated or specifically disadvantaged. The second conversation I had that felt like it was giving valuable information to the participants was with a young group of music leaders. They were members of a local rock band, and taught eager young teenagers how to play guitar, bass, and drums, three days a week at a local arts centre. I led a workshop on rhythmic notation with them and their students. At the start of the class, and at the end, one of the members of the band said to me, somewhat apologetically, “we don’t really know anything about music reading, or other theory. We just play completely by ear.” In his voice I could hear a hint of feeling inadequate. I wanted to address this directly. I told them that in fact, most of the world’s musical cultures don’t use music notation in their traditions. They didn’t know this, and looked surprised to hear it. I listed musical cultures from different parts of the world that don’t use notation. I didn’t want to downplay the usefulness of music notation knowledge, or to suggest they didn’t need it – if they are interested in learning it, then they should have the opportunity to do so, as far as I’m concerned! But this was not the first time I had heard a skilled Timorese person downplay their own skills due to not knowing how to read music. It wasn’t the first time that I’d heard a hint that knowledge of music notation was considered by many to be the pinnacle of music knowledge – perhaps because not many Timorese people know how to read music. In the past, only those who studied in the seminary were taught to read music. I wanted to remind these guys of the very strong skills they already have, that they already share with their students. “In the UK, for a long time the music education in schools was very focused on this kind of music learning – note-reading. But this kind of music was very different to the music that young people loved participating in outside of school, and students became bored, and stopped doing music in school. Then a researcher named Lucy Green did some research into how popular musicians – musicians that play rock and pop music – learned their musical skills. She discovered that they learned music by ear, from CDs, that they formed bands, and learned through playing with their friends. These kinds of interactions are important. It is easy to forget how isolated many people in Timor can be from the outside world. It is rarely shared with them through their media, although increased access to the internet may see this start to change more in the future. Thinking about these post-interview conversations, it seemed like one of the most valuable things I could offer was to reflect a different version of themselves (and their knowledge) back at them, and to validate their efforts, or suggest manageable alternatives that they can imagine themselves doing. Showing videos offers a kind of proof that it is possible. And describing the situation in other parts of the world helps them to see their own efforts in a bigger context, and hopefully means they start to give themselves credit for all that they have achieved so far. By being present in an environment, you become part of the context and things will subtly shift and adapt in response. Ethnographic and social science researchers need to be aware of this. By asking questions and showing interest in people and events, you are in effect asking people to direct their thoughts and focus in particular ways, and this can in turn affect their actions. These are the rules of interaction in action. It makes the research process fascinatingly messy and multi-layered. I’ve now completed two fieldwork trips to post-conflict countries for my PhD research into music education and participation initiatives in conflict-affected settings, and these unintended consequences of my presence and participation are interesting to document and ponder. Last year, when I was preparing to do fieldwork in Bosnia-Herzegovina, I reviewed relevant websites and information available online. The focus of my research was the Pavarotti Music Centre [PMC] and I visited their website. It was only written in Bosnian. The PMC was originally started by UK-based NGO, but today it is wholly-owned by the local government of Mostar, Bosnia-Herzegovina, and I assumed that having a monolingual website was a kind of assertion of the PMC’s place as a Bosnian/Mostarian institution now. Around that time I also got in touch with the Director of the PMC, introducing myself and informing him of my research. When I got to Mostar I spoke with the Centre Administrator, a woman that I’d worked with there in 1998, about obtaining copies of the current ‘mission and vision’ statements. She told me, “Well, of course they are on our website.” I confessed that my Bosnian language skills were too rusty to give me a complete understanding of what was on the site. “No, it’s in English as well,” she told me. I was taken aback, as I thought I had read the website extremely thoroughly. Had I somehow missed a little Union Jack in the upper left hand corner, indicating I could read the text in English? Later that day, I revisited the website, and sure enough, there was an English language version. Of course it is possible that Union Jack was there all along and I missed it. But it is also possible that, as I began to make contact with staff at the PMC and let them know of my interest, they began to think about the external image of the PMC that was available to people around the world. It’s possible that the site was updated with an English language version sometime between the first time I read it, my emails to the Director, and my arrival in Mostar. It is inconsequential, of course – who cares when the website was updated? – but I use this story to illustrate the way that outsider interest can influence levels of self-consciousness/self-awareness. This in turn can generate changes of behaviour or new actions in response to the perceived scrutiny. I have three case study countries I am investigating for my PhD research; Bosnia is one case study country, and Timor-Leste is another. 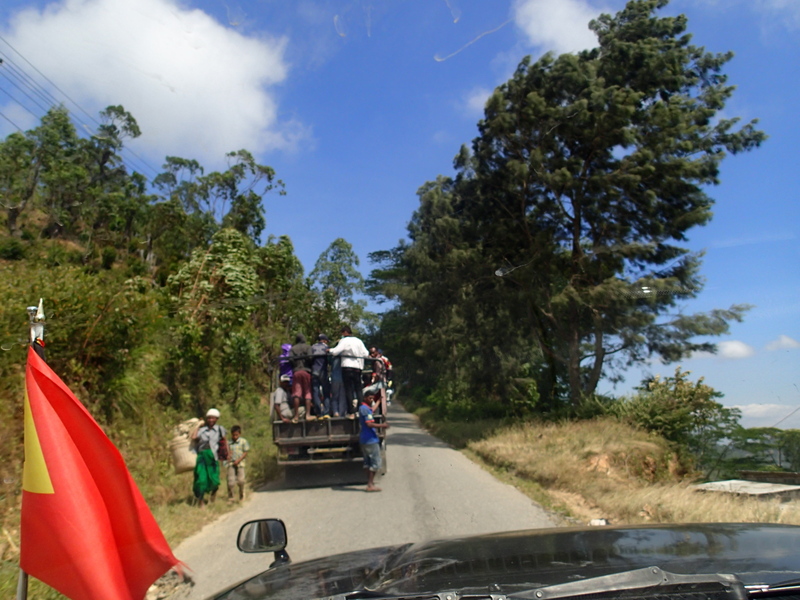 I have just returned from a month of fieldwork in Timor-Leste, based mostly in the capital city Dili. 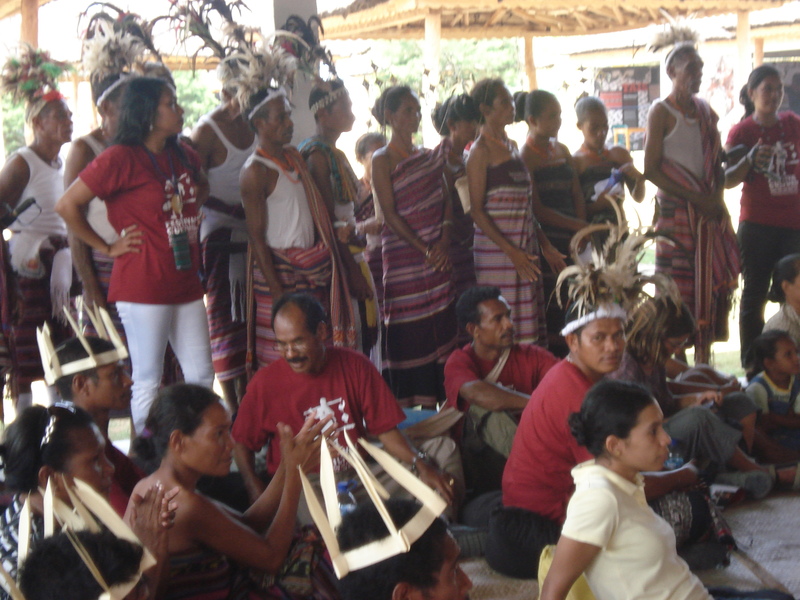 In Timor-Leste, plans have been in development in recent years to establish an Academy of Arts and Creative Industries. Staff from Griffith University in Australia consulted on the initial idea, and a Timorese implementation team is in place. However, while the government has agreed that the Academy should go ahead, things have slowed somewhat, according to some of the people I interviewed – artists, senior government staff, arts organisers – for my research. How well known is this Academy of Arts and Creative Industries project? At various times over the last few years, there have been events – concerts, conferences, forums – that have drawn media attention to the plans for the Academy. However, you couldn’t say that the project occupies any kind of prominence in the minds of the general population of Timor-Leste. It is a possible topic of conversation among the small number of people currently engaged in areas of contemporary arts practice in Timor-Leste. Therefore, I was extremely interested to see this piece of graffiti on the wall of the building that is the home of the Secretary of State for Art and Culture, the government department that has been driving the Academy plans. It appeared ten days after I began my fieldwork in Timor-Leste. There are different ways of interpreting the graffiti artist’s statement. The word ‘Akademi’ could in fact be more general, and refer to the Art and Culture building, suggesting it is a “dead house of art and culture’. 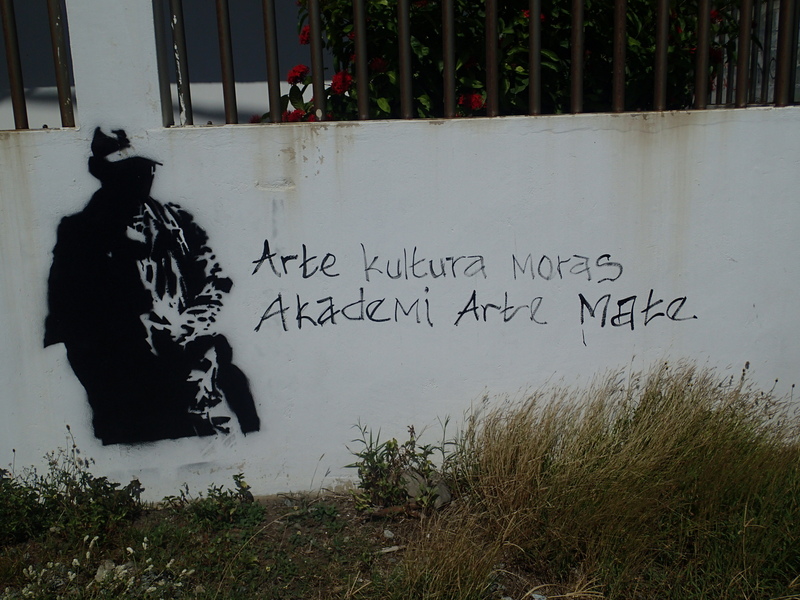 The words ‘Arte Kultura’ could refer to art and culture in Timor-Leste, or could refer specifically to the government secretariat. Who might have done this graffiti? And more to the point, why do it now? There were no other events taking place, or media attention (as far as I’m aware) that might have shifted people’s attention to the Academy of Arts project at that time. Was it because I was there, asking questions, and directing people’s attention towards a project that had fallen frustratingly silent at that time? Or were there other influencing factors? Was graffiti like this a regular occurrence? While street art and graffiti are not uncommon in Dili, the reactions of many of my research participants to my photograph of the graffiti suggested that the content and its placement on the wall of a government building were noteworthy, and particularly provocative. The graffiti remained on the wall for less than a week. I first saw it on a Sunday morning. It was gone by the following Saturday. Whether coincidental, serendipitous, or an unintended consequence of me asking questions and being interested, I am certainly not complaining! It’s a powerful image that alludes to some of the key issues impacting contemporary cultural life in Timor-Leste. Sickness. Death. Government efforts. Artists wishing for more. Hopes, expectations, and disappointment. Lots of layers to peel back and unravel here. A second theme that wove its way through both the Community Music Activity commission seminar and the main ISME conference in Greece this year was that of the (musical) tensions that continue to play out in post-colonial contexts between the former colonisers and the colonised, and the value of indigenous knowledge and ways of knowing alongside Western knowledge. It is a big theme and a complex one, but when I reflected on the two weeks’ presentations it was interesting to see how often it emerged, even if the post-colonial tag wasn’t part of the paper’s title or abstract. My reflections here consider specific projects in Brazil, South Africa, Timor-Leste, indigenous Australia, and Aotearoa/New Zealand. On the first day at the CMA seminar, we heard about a project in Bahia, Brazil, to give wind players of the many community bands throughout the region some expert tuition in playing their instruments. Presenters Joel Luis Barbosa and Jacob Furtado Cantao explained that these ‘band courses’ are provided by the Brazilian government and involve teachers from the city conservatories and schools of music. However, the experts tend to come from a more formal, ‘concert music’ playing tradition – a legacy of the era of Portuguese colonialism, connected in style and approach to European/Western art music. Recently I put together what is probably my last Timor-Leste video – and my first iPad movie creation! It shows the book-making project that my friend Victoria Ryle (from Kidsown Publishing) led on the veranda of the Lospalos house in November 2010, with a group of local children. Timor-Leste is a country with extremely low levels of literacy, particularly among the adult population (though there are now improved stats coming in for school-age children, which is very good news and testament to the hard work in building up the school education provision across the country in the last decade). There is not a strong book culture among the general population as far as I could tell – what books are available for sale are in Indonesian, and hardly any books are published in the national language of Tetun. The Alola Foundation has published/sells a small number of children’s books (3-4?, possibly a few more) in the national language of Tetun which I bought in Dili and took with me to Lospalos. Beautiful classic children’s books by wonderful authors like Mem Fox (you’ll see an image of one little girl pouring over a copy of Whoever You Are, as if she is trying climb into the pages). But the lack of books for children to look at means that children rarely get to see their national language in print, telling stories that are relevant to their own lives. A children’s book in their local language, Fataluku, is almost unheard of! When Victoria and her husband Simon came to stay with me in Lospalos we decided to hold an impromptu book-making workshop. Children came along and were invited to draw pictures of things they liked, to paint and colour them, and to have their photograph taken. All of this visual material went back to Melbourne with Victoria, and less than 2 months later, two books had been created. You can see examples of the books on the Kidsown website here and here. When the books arrived at the end of January, we held an impromptu Reading Club on my veranda. Children gathered together to read the new books, and the books I’d bought in Dili. Those who knew how to read, read to their younger peers. Children read aloud to patient, listening adults. The youngest children watched and listened, and many of them held books for the first time, learning to turn the pages when prompted. The video shows photos of this book-making and book-discovery experience. The great news is that Kidsown Publishing has continued to work and run workshops in Timor-Leste, working in partnership with the Alola Foundation, Ministry of Education (Government of Timor-Leste), Many Hands International and World Vision. The books are part of a larger literacy and children’s literature initiative, and the flexibility of community publishing is giving the possibility of publishing books in local languages, supporting young children to develop literacy in their mother tongue first. This one was a true labour of love to edit – you’ll have to forgive a few odd transitions, and please admire all the segues that line up the musical phrases without skipping a beat, as I was working with very fragmented raw footage for this project! A dilemma that comes at the end of many projects in developing countries is what to do with the materials you have been using, or that have been donated, once your project ends. It’s a dilemma about realities and likely scenarios, about ownership and power, access and equity. Years ago, when I worked with War Child in Bosnia-Hercegovina, all the kindergartens in East Mostar had just been refurbished. A donor gave every kindergarten a collection of instruments, the idea being that when the War Child musicians came in to lead workshops, each kindergarten would have instruments for the children to play. But when the workshops started some weeks later, almost all the instruments had gone. Where, no-one seemed able to say. Stolen? Perhaps… but when people are poor, and suffering, and have so little, it is also likely that donations like this can end up in people’s houses, available only to their children and no-one else. Perhaps this is under the guise of safe-keeping. Another common occurrence with donations in developing countries can be how quickly things get broken or damaged. Perhaps this is because equipment of the kind we are used to in wealthy privileged Western countries is completely unfamiliar to the people receiving these donations, and they don’t know how to use them with care or awareness of their potential fragility. Perhaps it’s because there is no suitable place to store things when they are not in use, so they get shunted and knocked about. It might also be that the quality of the donated goods was not robust enough for the local environment. Many things can happen, some of which are within people’s control, and some that are not. Bear in mind too, that the energy required to take on responsibility for something new, can be enormous, especially when you are functioning on just one meagre bowl of rice a day. So therefore, it is tempting to leave them in the care of an organisation or institution that has the capacity to store them and protect them. I’ve seen this before too. It can mean instruments that were designed for children to play with, explore and experience get kept locked in a cupboard, with no-one considered special or important enough to use them. It can mean that the custodians see them as a money-making opportunity, charging exorbitant fees to those who wish to use them, whether for educational purposes or otherwise. (I had direct experience of this kind of entrepreneurism in Baucau). Basically, I think there are no great solutions about who to leave your things with, and certainly no hard-and-fast rules you can use to find your ideal solution. Ideal solutions would be – a safe place where instruments can be stored, where other people can access them freely, but where someone is assuming a custodial role, ensuring expectations for care and responsibility are met by those borrowing the instruments. In that way, donated things become a local resource, and can be used by the people they were intended for. In this project, we had made a number of instruments from recycled materials (bells from bottles and drums from buckets), from local materials (the kakalos, using Maun M’s design and guidance), and from donations (the chime bars). We weren’t planning to take any of these with us, and the question of where to leave things was one that generated much discussion between Tony, Kim and I.
Tony was the person who had made the kakalos, and he pointed out that they were in fact easy to make. Surely the most significant thing here was that we knew the maker! 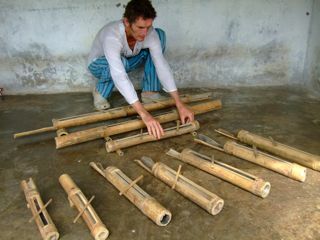 If the instruments got broken or lost (or burned for firewood, or any other such event), they were easy enough to make again, as they only required bamboo (locally available), a saw (easily borrowed or purchased) and a machete (the number one can-do item in most Timorese households). We could just distribute the ones we have out into the community, he suggested. But, I countered, there is value in having a set. It creates the possibility of an ensemble. Wouldn’t it be wonderful if, as a result of our time here, some of the local boys decided to continue playing, and created an ensemble? That would be much harder to do if the instruments got disbursed widely. Also, we know that new things in any household get shared by everyone, and the youngest children in the household are rarely in any position to lay claim to them, because of the way the family hierarchies work. The kindergarten we had visited at Esperanca Lorosa’e had impressed all of us. The staff were clearly well-trained, motivated and incredibly professional. They wore uniforms to work, and led the classes as a team, all participating and encouraging. Their response to our music workshop had been one of excitement, tinged with disappointment that there wasn’t more opportunity to work with us again. They’d told Kim they were interested in using some of the instruments we’d demonstrated in that workshop in their classes – they hadn’t seen anything like my music workshops before and were excited. They’d loved the thunder-makers and the bottles in particular. Therefore, we decided to give all the bottles, buckets and the four smallest kakalos to the kindergarten. I also gave them the sets of pastels I’d bought in Dili and some of my left-over drawing paper. In the end it was decided to ask the local education authority to store them, with the understanding that they were to be accessible by schools and groups in the area (including, I hope, visiting malae working with local children). Tony and I felt sad that we hadn’t been able to find a more community-based home for them. Would the Motolori children ever see them again? They loved playing them so much! And had developed such strong skills on them. 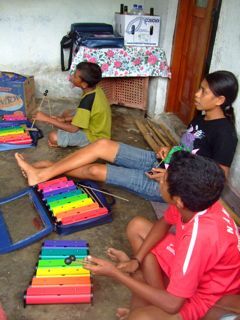 We also remembered the way some of the teenage boys from the Plan International band recording program had dropped by the house one afternoon, and after watching the local youngsters playing the chime bars, been eager to play them and utilise them in their own songs. Tony decided to give the kakalos to Maun M and his family. After all, he had been the inspiration for making them, he seemed to be the most engaged, music-minded adult we had met locally (the recorders Tony and given them were played constantly in that house, usually well past midnight), and his large family had been part of our jams from the very beginning. I had some misgivings. We’d gathered, even from before the event of the burglary, that people seemed to distrust this family. And at the certificate presentation, I felt unsettled by the cockiness some of those boys seemed to be displaying to the others. When the other regular boys heard of the plan to house the kakalos with that household, they looked distinctly dismayed, even horrified. Does everyone know who came into our house? I wondered to myself. Do they think that it was someone from this family Are we being gullible fools? But we’d never know the answer to this. And in the end Tony had the right response. So that was how we dispersed all the musical materials. And despite my concerns about the fate of the kakalo collection and the opportunities the local boys might have to play them – or any other instruments – from now on, I couldn’t help but nurse some small hopes. Wouldn’t it be great, I mused to Tony and Kim, if, when we or Many Hands come back, there is a kakalo ensemble here in Motolori? Maybe they will organise themselves and continue to play. Maybe someone will take notice of them, and they’ll get to perform. Maybe in a year or two, the Lospalos kakalo players will be invited to Ramelau Festival, or the Dili Independence Day Cultural Festival! That would be a great outcome indeed. We also gave Maun M’s name to the kindergarten teacher. “This is the man who can make more of these instruments”, we told her. Another wonderful outcome, therefore, might be about a change in status for this family and for Maun M in particular, recognised as cultural contributors, as the go-to guy for all bamboo instruments and musical ideas. This too, would be a great thing. Legacies are hard to attribute or predict! In any case, this residency was more about cultural exchange and learning, than about me leaving some kind of legacy in Lospalos. But during the time that we were there, some things did seem to change. From the time that we started to play our instruments on the verandah, other wind instruments began to appear in the street – bits of pipe, a recorder, even an ancient old buffalo horn. These were heard everyday, at all times of the day. People also sang a lot. They do this anyway, but lots of the songs that we heard them singing were songs we’d taught or sung in our verandah sessions. Also, children played games together in our garden who at the beginning, didn’t play together at all (such as the landlord’s children, who at the beginning always went back to their house as soon as the dirty, noisy, rough boys from over the road turned up to play). Maun M came with us to play live on Community Radio, after having a recorder for just a day, and his skills as an instrument-maker attracted the attention of all the ANAM students as well as us. (This may have resulted in resentment towards him from others in the street, which may be why he was fingered as the culprit in our burglary – this was one theory that was posited). Who knows, all of these things may have happened anyway. Or they might be part of the natural cycle of life and activities that is always unfolding in Lospalos. But there we were, living amongst that community for one small part of that life. We instigated some new activities, and I do hope that those experiences and interactions with us have created some new senses of possibility and change for those we met and engaged with. I hope that all the people we worked with have been changed by the experience as much as we have. Kids were hanging around all day that last Sunday, waiting for us to start playing. It was a busy day for me – there was a whole house to clean and pack up, people to farewell, and certificates to write out. We told them we’d start playing at 4pm. Rain started to pour just as we started the jam. As always, the udan boot [heavy rain; literally, ‘rain big’] was heavy and noisy and relentless, the kind of big, wet rain that drenches the ground in minutes and that always seems to inspire Timorese children to fling off their clothes and run around naked. It inspires the same in me, truth be told, but I exercised great restraint and stayed clothed and dry under the roof of the verandah. On this day, the kids came over and got the instruments out themselves, and just started playing. 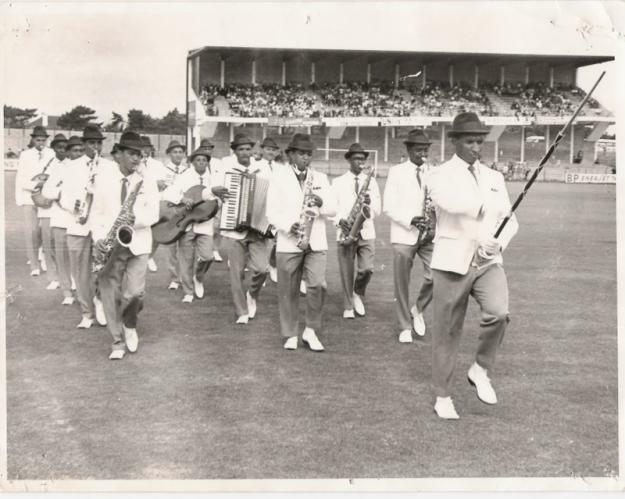 I loved it when this happened – it showed what a wonderful learning journey these energetic, slightly chaotic boys had been on with us, and how their approach to the instruments and music had changed since they first started joining us on the verandah. They established their playing to the backdrop of the udan boot thundering on the roof and ground. They’d got started playing, and they were all sitting in the groove for quite a few minutes – all without any guidance or leadership from us. But then – as if all their concentrations had started wavering at once – the groove started to get shaky. But before anyone called attention to this, and before it fell apart completely, it pulled back together, and locked in again. It was as if they all realised they were about to lose it, and with their intuitive sense of ensemble, rescued it and got themselves back on course. “Let’s keep this jam for just the kakalos and buckets,” Tony suggested. The chime bars were packed up and in their boxes, awaiting their transport to their new home. The kids hadn’t got them out. Tony and I decided to play our instruments, Tony on the now famous alto sax (that which had got away, and come back to us), me on the clarinet. This too, was a development for our jams. Any player of wind instruments will tell you how tricky it can be to get to play your own instrument in a jam session that you are also leading… leading nearly always requires use of your hands and your voice, as does playing! But on this occasion, the boys were solid enough to give us space to play with them and not throw them off course. We improvised all together for a while, and then Tony put down the sax in order to lead some call-and-response rhythms with the boys. I continued to improvise in the gaps, and somehow, what I was playing began to morph into Oh hele le, one of the most well-known Timorese anthems. We hadn’t worked with this song before, but of course everyone knew it, and they began to sing along as they played. The rhythms changed too, so that they became a simple, pulse driven accompaniment for the song. Other people – new faces, including some girls – started arriving when we played Oh hele le. This morphed again, into the traditional Fataluku song we had sung in the Toka Boot the day before, and again the boys sang along. Mostly we all just sang for ourselves, not necessarily projecting our voices out into the group. This felt like our most organic jam yet, and perhaps the most equal. It didn’t really need a lot of leading. At the end, we told them about the certificate presentation. We asked them to help us put everything away, and then to go home to get a parent or someone important to them, to come and watch them receive their certificates. We would start again in 30 minutes. The boys gathered up the instruments, now well-schooled in how to do this without dropping them, or rushing and pushing each other. Certain boys automatically assumed roles of authority, collecting all the sticks, instructing others where to put things. Then the group dispersed, and we cleared the verandah and put out the mat, ready for the presentation.